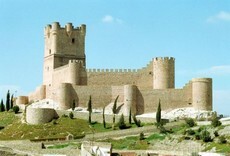 This trip takes in the castles in the Medio and Alto Vinalopó districts, as well as the area of Foia de Castalla. The first castle along the route, which follows the A-31 towards Madrid, is Mola de Novelda Castle, with its unique triangular-shaped keep. Right alongside this is the La Magdalena Sanctuary , with its Gaudi-inspired features. Within the town stands the Modernist museum house known as the Casa Museo Modernista. In Petrer, visitors can admire a recently restored mediaeval castle, while in Sax there is another castle of great beauty, set stunningly against the surrounding rock. Atalaya Castle is located in Villena, where visitors can also admire the “Tesoro de Villena” or Treasure of Villena: 60 pieces of Bronze-Age gold. There are also two Gothic temples: the Templo de Santiago and the Templo de Santa Teresa. The next castle along the trail is at Bañeres de Mariola. To reach here, visitors must turn off and take the CV-81 towards Benejama. Rising to an altitude of 800 metres, this castle offers superb views of four difference provinces (Valencia, Alicante, Albacete and Murcia). Towards the south rises the Sierra de Mariola mountain range. Heading back towards Alicante on the new A-36, visitors will pass through Biar, with its beautiful castle and the Gothic Asunción church. It is well worth taking time out to stroll through the town. If heading back to Alicante along the A-7, the last fortress on the trail is at Castalla. A visit to Tibi is also recommended, particularly to see its 16th century reservoir, which is the oldest in Europe still in operation. Getting There: From Alicante take the A-31 motorway to Villena. From Villena to Bañeres take the CV-81. From Bañeres to Biar, the CV-804. From Biar to Alicante, the CV-80 and the A-7 motorway.